This should have been an evening report from Sunday (today is Tuesday) but I had a lot going on this weekend. I also wanted to spend some time trying to find out what was really going on with the tides in the Hudson River. Sunday the tide went out further than the newbies in Cheviot, a river hamlet in Germantown, NY, have ever noticed before. There is an island off Cheviot Landing, where back in the day, barges used to stop to load up with produce to feed New York City. Portions of a strip of land that used to be the causeway to the island pop out of the river when the tide goes down. The causeway creates an ice dam in the winter, and a field of green that stretches north beyond where I can see in the summer. I used to think the green was algae, but this year I could see it was plants – perhaps the invasive water chestnut? The water is shallow on the north side of the causeway and I’ve watched many a canoe become grounded. Just as I was surprised when I watched my dog walk out into the Hudson, I’ve watch many a surprised canoeist realize he can get out of the canoe, walk in the river, and drag his boat to higher water. Sunday the tide was very low. The water dropped even more than is shown in the picture below, until I could see exactly where the chanels were to guide my canoe to get through or around the causeway. The river was so low that one could walk along a muddy edge of the east shore – and one of my neighbors did. She and I have been looking on-line for some mention of this unusual tide, but even this morning I have found nothing. Could our phenomenon have been the down side of proxigean springtide? The site lists the proxigean springtides up until 2023, but February 26, 2012 wasn’t there. Poking around more I discovered why. This Deal Beach isn’t in New Jersey – the hip beach for college students where my sister hung out in the sixties — but is in Kent on the English Channel. It looks like a delightful town to visit. Poking further on the web I found SeaAndSkyNY, and I highly recommend it to anyone interested in weather and waters of NYC. There is a post about a king tide in October 2011. It advises beachcombers of a great chance to go foraging on the mudflats during the extremely low tides during a king tide. Looking to discover if our phenomenon could have been a “king tide” I found in several places that the term, used especially in Australia, doesn’t have any scientific meaning, but is used to refer to an extremely high tide. It seems strange to me that this very low tide, has not been reported on the web. Those of us in Cheviot, who were fortunate enough to have witnessed it, are still talking about it. As I look out my window right now – just about noon – the causeway is partially exposed, perhaps a little more than usual. There are white sea birds sitting on it. I hesitate to identify them as gulls or terns. Could someone please let us know a little bit more about our Sunday at the Landing? 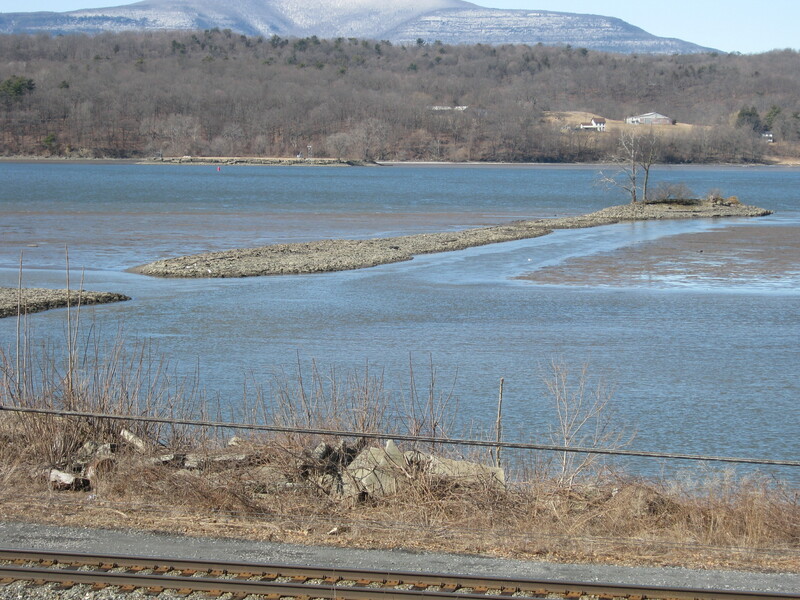 This entry was posted in Observation, Where I Live and tagged Cheviot, Nature, The Hudson River, Tides by spoonbeams. Bookmark the permalink. It was actually driven by strong winds blowing from west to east — it pushed New Jersey coastal ocean waters offshore and can have an effect similar to the height of the tide, basically a reverse storm surge, a “blowout”. Philip — Thanks for your quick reply. I’ve got more to think about now as I look outside my window. Anyone interested in an expanded and accessible description of this low tide should refer to his post Blowing out the Ocean’s Waters on SeaAndSkyNY. .